Lots of people think we ought to go back on a gold standard because that would limit the government's power to create inflation by debasing the currency. As uncomplicated a solution as that may sound, there are many pitfalls to a gold standard, like not being able to stimulate in times of recession or worse--depression. The fact is, in today's modern global economy the notion of going back on a gold standard is dismissed by most economists as not being practical. But is that how they really think? Back in 2005 then-Fed Chairman, Alan Greenspan, had an interesting exchange with Representative Ron Paul while testifying on the state of the economy. Paul asks Greenspan why central banks and governments around the world still hold huge amounts of gold if there is no longer a gold standard? "...since the late '70s, central bankers generally have behaved as though we were on the gold standard. So that the question is: Would there be any advantage, at this particular stage, in going back to the gold standard? And the answer is: I don't think so, because we're acting as though we were there." The world may not be on a gold standard, but central banks are still acting as if we are! Economist Thomas Palley has a great article about speculators and their impact on oil prices. He argues that there is strong evidence that speculation is driving up prices, and therefore, "policymakers must act to rein in behavior that has imposed huge and needless costs on the global economy." As many of you already know, I totally agree with this view. What happened to the stimulus? We know from looking at second quarter GDP that about $30 billion of the $168 billion stimulus was spent, and that had an overall positive effect on consumption. But the question is, what happened to the rest? The answer is, it went into savings. 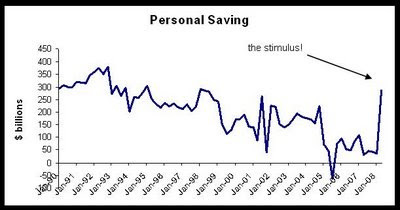 Take a look at the chart of personal savings below. It ballooned to $285 billion in Q2, mostly because of the money the government sent out to people. So the stimulus was far from a "one-shot-deal" as many like to say. It remains in the economy like potential energy, and over time, it will likely be spent. Even when it is spent, it still won't go away. Instead, it is transfered from consumers to firms, who then hire, spend and invest themselves and the cycle continues. Think of it like a stone being tossed into a still pond. The splash creates ripples that start off big and continue in a diminishing fashion over time. Even though we don't see them after a while, their effect on the water is still occurring. The questions from the middle class/middle America are. > > 1) Is the pressure to keep the dollar from rising mostly aimed at > reducing strain on the big three domestic autos> > until they stabilize? Is this cheaper than direct aid? Easier to hide? PERHAPS, AT LEAST PARTIALLY. MANUFACTURING INDUSTRY LOBBY SEEKS COMPETITIVE BOOST VIA LOWER DOLLAR EXCHANGE RATE. POLICY SEEMS TO BE INFLUENCED BY THIS. > > 2) Question for YOUR trader knowledge base. Has naked shorting been > illegal all along? Should the spotlight be turned> > on enforcement? Would new laws or regulations just be ignored as well? > Could the media at least clarify why it continues> > if it is not legal and demand enforcement? FROM WHAT I UNDERSTAND, YES, IT HAS ALWAYS BEEN ILLEGAL. ENFORCEMENT IS INCREASING, BUT GRUDGINGLY, IT APPEARS. > > 3) How can brilliant people ( Art L./Dan F.) say we should "don't > worry, be happy" and just buy energy from OPEC because> > they are good at producing and we are good at consuming? Do you buy > your ammunition from people who want to> > kill you just to get a discount? Energy IS ammunition!! No! It is more > important than ammunition. ALL THINGS BEING EQUAL, IF IT WERE A PURELY COMMERCIAL RELATIONSHIP, DAN F. AND ART L. ARE RIGHT (AND BOONE PICKENS, WRONG) WE SHOULD BE BUYING FROM OPEC FOR THE REASONS THEY SITE. HOWEVER, IT IS NOT PURELY COMMERCIAL: THERE ARE REAL IDEOLOGICAL DIFFERENCES THAT MAKE IT A DANGER TO NATIONAL SECURITY. THAT IS WHAT WE ARE "FUNDING." > > 4) Most of us off wall street folks could get behind some form of > assistance for financial's if we heard more conversation> > about what would come after. Business as usual? Are the same people > already working on the next scam?> > Many wallstreet indians may be suffering but the chiefs who stole the > apples remain in place, or leave with more than> > enough booty to open up a new scam across the street.> > As for the point of B. Sterns goes down, I will feel it in my middle > class life..... I already do... Commodities went up,> > disrupting my life and business because money fled from financial's. It > had to go somewhere. I had to make dramatic> > adjustments.. Just tell me what will change on wall street and who will > change it. ASSISTANCE IS NECESSARY BECAUSE OF THE SYSTEMIC RISKS THAT WE NOW FACE. IN THE FUTURE, GREATER REGULATION AND OVERSIGHT SHOULD PREVENT THESE EVENTS OR KEEP THEM TO A MINIMUM. AND, (DARE I SAY THIS), WE SHOULD RETHINK TAX POLICY THAT ENCOURAGES THIS TYPE OF SPECULATIVE EXCESS. > > > Sorry about the venting... Thanks A. C.